Every college student loves to get packages especially when they contain our famous chocolates! 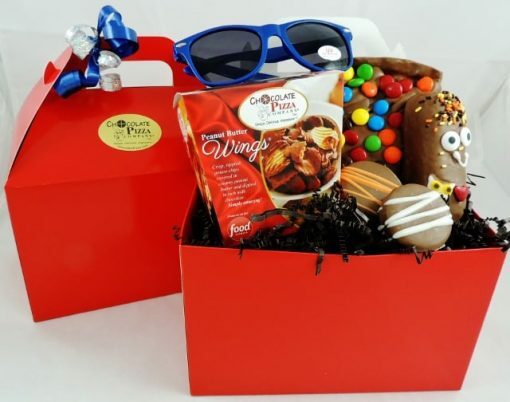 Whether it is a college send-off, a welcome back to school surprise, a graduation gift, a study-break or just thinking-of-you, this “College Survival Kit” will bring a smile to your favorite college kid. 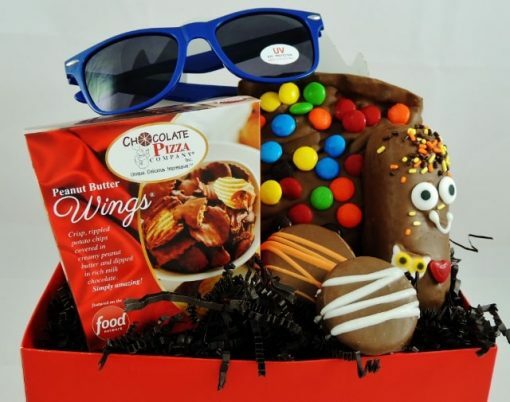 We pack this box of treats with our delicious Peanut Butter Wings® (8 oz), a candy topped Slice of Chocolate Pizza® (6 oz, milk or dark chocolate, select above), one very cool “Moompa” – a cream-filled sponge cake (yea, you know the one) dipped in milk chocolate and hand-decorated with personality all their own (no two Moompas are ever the same), and 2 chocolate covered cream-filled sandwich cookies (a mix of vanilla, mint or peanut butter). We finish every College Survival Kit with a cool pair of shades that they can use everyday. It all comes in a handled tote box. Move to the head of the class when you send your favorite student this special reminder that you are thinking about them! College is a jungle out there so every young explorer needs a College Survival Kit. The good news is we have the best! It’s all about timing and impact. The timing is soon after they start back to classes – after the reality of having to get up, get somewhere and do something has set in again – that’s when they are most appreciative of any good news. And there’s no better good news at that point than finding a slip in your mailbox that says, “you’ve got a package.” Imagine their excitement when they rush down to the mail-room and find their very own College Survival Kit waiting for them! That’s where the impact comes in. 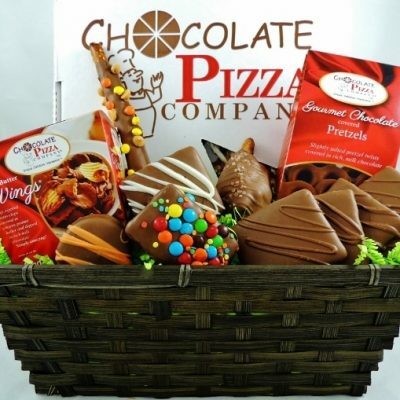 That’s where Chocolate Pizza Company helps out. You see, we have this super cool tote box called, College Survival Kit, that was made for these moments. 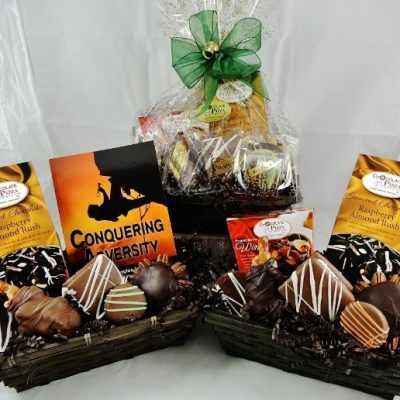 Fluffy gift baskets with overwrap and bows would not be something many of them would want to be seen carrying up to their room but a subtle, handled-tote is just the right container for a gift packed with gourmet chocolate treats. Here’s the perfect surprise to make their day. College Survival Kit come with Chocolate Pizza Company’s famous Peanut Butter Wings – crisp, rippled potato chips covered in creamy peanut butter and dipped in chocolate for the ultimate friend-making magnet. Then there is a slice of Chocolate Pizza with its blend of homemade English toffee and colorful candy topping. 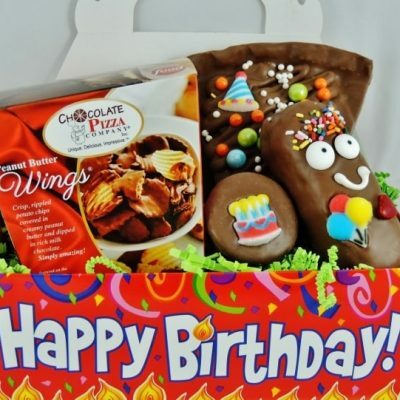 On the whimsical side of things, a Moompa greets them – hand-decorated and filled with personality, this chocolate covered creme-filled sponge cake is the unheralded hero of the box. Two chocolate covered cookies complete the confectionery feast and are just the right size for popping into your backpack for that in-class snack. Rounding out the surprises is a cool pair of sunglasses – you can never have too many pairs of shades. There’s a very good chance that sending your favorite college student a College Survival Kit will result in one more significant outcome … communication. That’s right, there is a high percentage chance that you might actually hear from your student after they receive this gift. It might be a text, it might be an email or there have even been documented cases of an actual phone call being made to say, “thank you.” What better reason to send them this surprise than the chance to actually have them call you. Amazing! So, remember to send your favorite college student a College Survival Kit … they probably still won’t do laundry for months but at least they’ll be thinking of you as they chow down on the best tasting chocolate on campus!